Fr. David P. Khoury, the principal at the Orthodox School has a positive outlook. 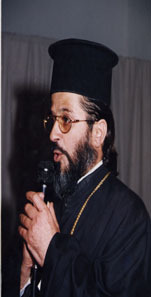 He has a membership of over two hundred families in the Orthodox Church along with Fr. Tawfiq Nasser the senior priest. Fr. David runs the school with 300 students and 24 teachers founded in 1770. The school began at an elementary level and in l990 officially became a high school. Fr. David says: “We have some distinguished things in our village, St. George ruins, great climate, good atmosphere, people help each other and cooperate with each other. Most people are related to each other in the village.” And, he is right, because his first cousin David C. Khoury (also my husband) launched the first micro brewery in the Middle East (l994) with his brother Nadim Khoury in order to boost the economy after the Oslo Peace Agreement. They created the first Palestinian product to be franchised and produced in Germany under the license of “Taybeh Beer” in Taybeh. A dream come true for their father Mr. Canaan Khoury who has the wish of every Palestinian Dad that the children get the knowledge and skills from the West but return to help their homeland and maintain their close family values. Fr. David discovered 4th century mosaics next to the new Orthodox Church and put up columns, build walls and basically created a small chapel in l987 to preserve this special site. The generosity of Taybeh people in San Francisco made this chapel possible. Generous donors abroad like Mr. Yousef Newas established the local laboratory for the health clinic. Mr. Newas also provides college scholarships on an annual basis to three Taybeh students at Birzeit University. Also, Fr. Jack helped fundraise money and build a housing complex for sixteen families in his parish. In addition, we have a four family housing unit build by the Latin Patriarchate. Currently, the St. Georges Church Housing Committee is seeking funds to help thirty needy families build their first homes on land donated by the Greek Orthodox Patriarch. One million dollars would build thirty skeletal units.